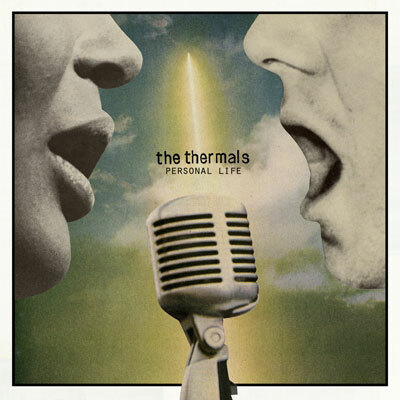 Portland indie-rockers The Thermals are known for writing nerdy, two-and-half-minute punk songs with an off-handedly topical point of view. You could call their most recent albums concept records, but that’s just a fancy way of saying they’ve been relatively thematically coherent. Last year’s, Now We Can See dealt with morality, mortality and science while their 2006 record The Blood, The Body, The Machine was a more narrative affair on the intersection of organized religion, governmental authority and personal agency. The group, led by singer-songwriter Hutch Harris, is getting ready to issue their fifth album next month. The album’s called Personal Life, and this time around, their focus is on love and relationships, the things that make relationships great, and the things that destroy them. It’s a direction hinted by the song “Separate” (issued earlier this year as one side of a split single with the Cribs), although lyrics like “separate I’m amazed I ever gave away all I held so dear” are ambiguous enough that they could just as easily be a pointed repudiation of political bipartisanship as they might be the post-break-up musings of a freshly single free-thinker.